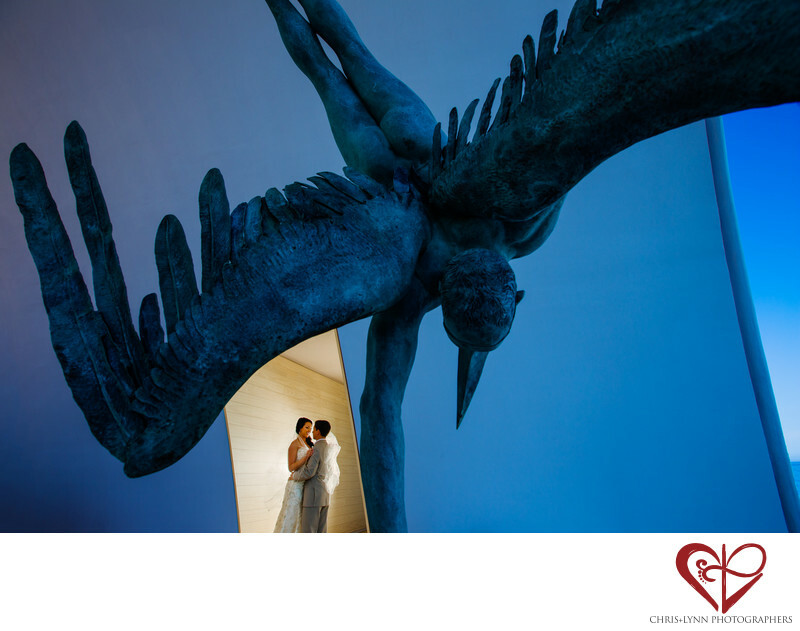 This dramatic wedding portrait was taken at the Marquis Los Cabos Resort. The couple were delirious with happiness and heat after their ceremony and stepped into this breezy lobby area to cool down and enjoy the fact they were now officially married! Lynn placed a gorillapod mounted Canon 600EX-RT flash behind them to illuminate the bride's veil while Chris shot the wide angle image to incorporate the modern Mexican sculpture into the composition. While we don't often shoot at the Marquis Los Cabos, we were quite impressed with the San Jose del Cabo resort's grand lobby framing the deep blue waters of the Mar de Cortes. And the resort's 'adults only' policy certainly is appealing to couples wanting peace & quiet during their Los Cabos wedding or honeymoon. US News & World Report recently ranked the Marquis Los Cabos as the number one all inclusive resort in the Los Cabos, Mexico area. For couples searching for an all-inclusive resort for their Cabo wedding, the Marquis Los Cabos is undoubtedly one of the top picks in Baja California Sur. Location: Los Cabos, BCS, Mexico. 1/180; f/8.0; ISO 100; 16.0 mm.